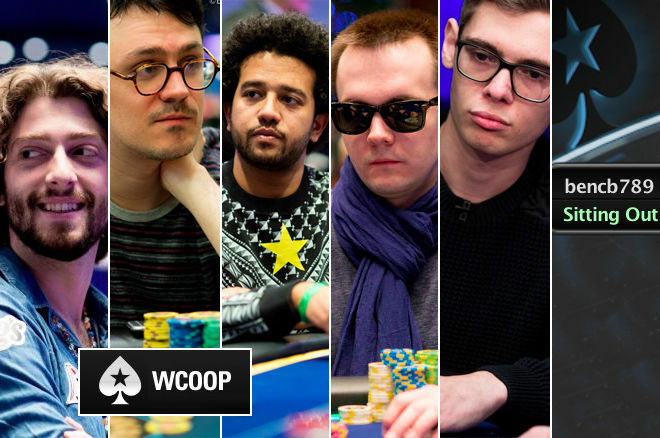 Just six players remain in the WCOOP $102k Super High Roller. @CrownUpGuy, of course, is one of them. An event people had been looking forward to for weeks started today. Not just the highest of high rollers got excited when the WCOOP $102,000 Super High Roller had been announced; railbirds from all over the world eagerly awaited the day it all started. Thousands of fans gathered for the biggest ever buy-in online poker tournament in the game's relatively short history. The $102,000-buy-in WCOOP Super High Roller was met with unprecedented excitement. Mikael "ChaoRen160" Thuritz was the first to sign up for the event. To some, it was like he was saying he was ready to take on anyone. Talal "raidalot" Shakerchi joined him in the lobby early on before Isaac "philivey2694" Haxton, Doug "WCG|Rider" Polk and "OtB_RedBaron" got there too. The event got underway with just those five registered, but besides the fans, you could bet a lot of prospects were scoping out the play as well. The first two to join the action while the first jabs had already been traded were high rollers Christoph "26071985" Vogelsang and Ben "Sauce123" Sulsky. Shakerchi lost a bit early on while Vogelsang was the first to really break loose of the 30,000 starting stack by winning a pot with aces. Timofey "Trueteller" Kuznetsov joined the action after the first break, followed by the entrance of Jason Mercier. His participation was expected but welcomed, as he had announced to live stream the event with hole cards on a 15-minute delay. With Jason Somerville by his side - for commentary, not strategic purposes - the PokerStars Team Pro started his grind. Polk, who had a little bit of a brawl with Mercier a couple months ago, had a stream of his own going at the same time. Belgian high-stakes regular "OtB_RedBaron" was the first to go. He got check-raised on the final card by Vogelsang and called with a rivered flush. Vogelsang had what he represented, the nut flush, and "OtB_RedBaron" clicked the 'register' button a second time, buying back in for another $102,000. Timofey "Trueteller" Kuznetsov was the second player to go. He got it in with a flush draw against the better ace-high of Thuritz, and after the river blanked for him, Kuznetsov too had to buy back in. Mikita "fish2013" Badziakouski, last year's third-place finisher in the WCOOP Super High Roller, entered the event and clashed instantly with Jason Mercier. The two got it in before the flop with Badziakouski holding aces against Mercier's kings. The classic cooler remained just that, no coming from behind for Mercier as he was knocked down to just 7,000 chips. He lost those not much later as he failed to improve enough with an open-ended against the top pair of former teammate Haxton. As Shakerchi busted with ace-king to Thuritz's tens and reentered, the railbirds anticipated a flood of new players with the late registration almost closing. Not before long, they got what they asked for. A slate of new players entered the event just about simultaneously. Justin "ZeeJustin" Bonomo, Salman "salfshb" Behbehani, Mustapha "lasagnaaammm" Kanit, Igor "lechuckpoker" Kurganov, Fedor "CrownUpGuy" Holz, Jason "jakoon1985" Koon, Ben "Ben86" Tollerene, Timothy "Tim0thee" Adams, Bryn Kenney, "bencb789", Nick "caecilius" Petrangelo, Brian "tsarrast" Rast and Daniel "Oxota" Dvoress had waited long enough and got in right before the late-reg closed. As Kuznetsov and Mercier entered a second time, the registration closed, bringing the total amount of entries up to 28. The prize pool of $2.8 million would be divided over the top three, with $1.4 million for the champ. Doug "WCG|Rider" Polk became the first to bust without the option to buy back in. He got it in with top pair against the flush and straight draw of Kanit. The four on the river gave Kanit a straight and Polk hit the rail. The elite of the elite had gathered; PokerStars was their battle stage as the railbirds almost couldn't contain their excitement. They took to Twitter, the YouTube comment section and Twitch chat to discuss the "donk moves" and "brilliant plays" of the best of the best in the world. They saw the likes of Bonomo (eights into kings), Petrangelo (failed bluff with missed flush draw into flopped straight) and Koon (flush draw against two pair) bust, while others gained lots of chips. Tollerene doubled with quads, Haxton saw his aces hold up against Rast and Kurganov busted Mercier's second bullet with jacks against the Team Pro's ace-ten. Ben "Ben86" Tollerene, last year's WCOOP $51,000 Super High Roller champion, busted to Igor "lechuckpoker" Kurganov. The two got it in on jack-eight-four. Tollerene had kings but was trailing as Kurganiv had two pair holding eight-four. The eight on the turn diminished Tollerene's outs. The river seven was a blank. Players busted left and right, and before you knew it, play was hand for hand. Not because there was money about to be awarded, but because there was a final table to play for. The players took to the chat box to complain about the procedure, but there was no changing it. The situation didn't take too long as Mikael "ChaoRen160" Thuritz, who had been tilted by it the most, busted in ninth place. His ace-jack failed to improve against the ace-queen of anonymous Swedish player "bencb789." With two tables merged to one, the official final table was set. They didn't get a group photo but instead received a screenshot from the live reporting blog. "OtB_RedBaron" had been the first to bust the event (and buy back in), and also became the first to bust the final table. He got it in good with queens against jacks but "bencb789" made a flush to see the sole Belgian in the field heading to the exit for the second time. "bencb789," who had just doubled Holz minutes before, was back in action. Bryn Kenney would become the last Day 1 casualty. His short stack push with tens was met by a re-push of Mikita "fish2013" Badziakouski. Badziakouski had aces and found no hiccups on the flop, turn or river. PokerNews will continue live coverage of the WCOOP $102,000 Super High Roller in the live reporting section. So check back in just under 15 hours for Day 2 of the biggest buy-in event in online poker's history.